Gov. Bruce Rauner answered questions from Illinois voters during his first-ever Facebook Live forum Tuesday, pushing elements of his agenda like term limits, redistricting reform and the need for a balanced state budget. In discussing the state's budget, Rauner noted that Illinois "should've had a budget more than a year ago and a truly balanced budget." Instead, Rauner and the General Assembly agreed to a six month stopgap compromise that was passed in June. On Tuesday, Rauner continued to push for a full, balanced budget. "I’ve looked back now almost 30 years, I can’t find a balanced budget going back ever," the governor said. "We always spend more than we bring in and what we do is we either don’t pay our bills, we don’t pay in our pensions, or we borrow in the bond market. And businesses look at that and they say ‘we’re not going to go to a financially irresponsible state’ and they leave." However, Rauner said that he was "cautiously optimistic" about getting a budget deal done after the November election. He said that, based on recent negotiations, he thinks the legislature will pass a full budget during lame duck sessions in December or January. The governor was also asked about term limits and redistricting reform, initiatives that he continues to champion. "Nothing would change the performance and the culture in our state government faster than term limits, also redistricting reform," Rauner said. "Both will change the culture immediately." "The system’s broken because our politicians are not accountable and term limits and fair maps can help get that done and will change the culture very quickly," he added. Rauner noted that Illinois judges have made it clear that both initiatives would have to be put on the ballot by the General Assembly, not by petition. He claimed that if those measures were put on the 2018 ballot, they would take effect a few years after and elected officials would see that the "games of manipulation," like the power of incumbency and special interest money locking lawmakers into office for decades, were over. "I think you'd see a number of people retire or resign soon, rather than waiting for a number of years because they would see the people of Illinois stood up and said, 'no more of the status quo, no more incumbents locked in office for decades, no more districts that are drawn like spaghetti noodles designed specifically to protect incumbents of either party." Rauner noted that two-thirds of November's state races don't have opponents. The governor's chief political opponent, House Speaker mike Madigan, is running unopposed and has been in office since 1971. During the forum, Rauner also said he was confident that the General Assembly would address pension reform this winter. 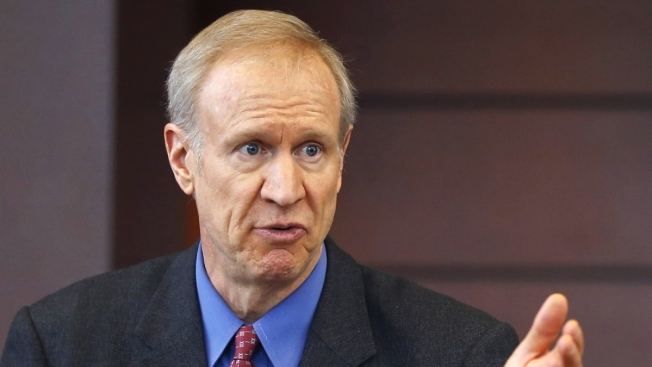 "I think we can come to an important solution to reform our pension structure," Rauner said. "Again, protect existing benefits, but put in place new options that are more affordable that employees can choose among their own choice, their own options. That's both fair and constitutional." Rauner claimed the reform effort would save the state billions and help to balance Illinois' budget "for the first time in decades," shoring up money for human services and schools. "Parents want and deserve options and we’ve got to make sure as we change our funding formula that options are on the table and we create the financial ability for low-income parents in particular who can’t afford to move or can’t afford private school tuition," Rauner said. "We make sure they’ve got the financial ability to choose a school that best fits their son or daughter." Rauner was also asked about criminal justice reform Tuesday. The governor said he is committed to reducing the prison population in a "thoughtful, comprehensive way." "We need to make sure that we are compassionate, but also we punish violent criminals in an appropriate way," Rauner said. "We create second chances and options for people to become productive citizens and not just repeat the cycle of crime and punishment." Rauner said the state needs to focus on things like mental health treatment, addiction treatment and rehabilitation and job training to "reduce the repeating cycle, reduce recidivism" and "restore people to good, productive citizenship so they can come back into society and be contributors rather than fall back into crime in that vicious cycle." He noted that he created the Illinois State Commission on Criminal Justice and Sentencing Reform, which has generated recommendations on the issue, some of which have been signed into law. Rauner also touted the newly minted Illinois Bicentennial Commission and the Governor's Office of the Illinois Bicentennial that will lead the planning for the state's 200th anniversary in 2018.